Sixteen students who successfully completed courses at Goodwin College as part of its Supplemental Nutrition Assistance Program (SNAP) Employment & Training initiative were celebrated for their hard work and taking chances during a celebratory ceremony on September 26, 2014. Larson was one of several dignitaries on hand to celebrate Goodwin’s largest and most successful SNAP cohort to date: 21 students from Bloomfield, Colchester, East Hartford, Hartford, and Vernon. Of those students, 16 attended the ceremony. Established in 1971, SNAP benefits help low-income individuals purchase nutritious food. The Federal government provides the majority of funding for the SNAP program, with individual states following rules set by the U.S. Department of Agriculture. Bremby lauded Goodwin’s implementation of the SNAP program, and praised the students for their efforts. Six of these students have already booked job interviews, and three have been offered employment. “You have the skill, the ability, and the knowledge to complete whatever you’ve started,” Bremby told the students. Goodwin College is one of four colleges in Connecticut offering training to SNAP participants. Since beginning its initiative earlier in 2014, 102 individuals have participated in the Goodwin program, resulting in an 87% completion rate. The Goodwin program offers courses in Office Administration, Customer Service Training, and Security Guard & Administrative Training. Scheinberg said that he was proud of the graduates and happy that Goodwin College could provide a stepping-stone on their path to success. “Being from a family that got our share of government food when I was a kid, there comes a point where you ask how to get from there to here,” Scheinberg said. The president thanked the students for having faith in Goodwin. “It’s our turn to give our faith to you as well,” Scheinberg said. A short reception followed the ceremony for the students, their families and guests. Goodwin College’s Histology program, which currently boast a 100% pass rate for the Board of Registry Certification Exam, has incorporated specially designed leadership classes into the Histology curriculum so that graduates will be able to enter the workforce with the skills necessary to become leaders in the field. “The didactic sections of Goodwin’s Histology program are very sound, so we decided to include a leadership portion to give our students an edge that will allow for growth and promotion in the future,” said Histology Program Director Kelli Goodkowsky. When making critical decisions in their patients’ care, pathologists rely heavily on the expertise of histotechnicians, who are responsible for preparing the tissue specimens pathologists use to render a diagnosis. Not only will graduates of the program have the skills necessary to be reliable employees, but they will also have acquired the critical thinking and writing skills to become influential leaders. To launch the new leadership program, Dan Noonan, Vice President of Marketing, Communications, and Enrollment and a Goodwin business professor, led a thought-provoking discussion on what it means to be an effective leader with a class of 9 students. Noonan quoted Simon Sinek, inspirational speaker and author of Start With Why: How Great Leaders Inspire Everyone to Take Action and Leaders Eat Last: Why Some Teams Pull Together and Others Don’t, who said: “There are leaders and then there are those who lead.” Not all those who lead are leaders and the difference between the two is crucial in the working world. Today’s healthcare field accounts for a massive part of corporate America and is in critical need of frontrunners who will guide their employees in creating a positive, productive working environment. With a substantial number of histotechnicians about to age out of the workforce, it is imperative that schools produce graduates with both technical knowledge and the transferrable leadership skills that will allow them to advance their careers and strengthen the field of histology. Goodwin College prides itself on its supportive work environment, positive academic and corporate cultures, and encouraging leadership. Coupled with the school’s mission as a career-driven institution, the addition of the Histology leadership program is a perfect fit. Noonan used Goodwin as a framework for effective leadership. “In order to be a leader, your job cannot be transactional, it must be transformational. Leaders must serve a greater purpose than their own,” Noonan stated. 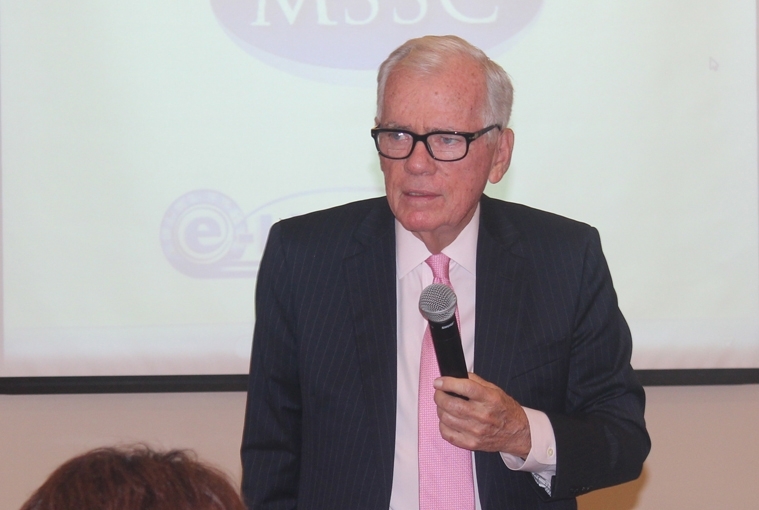 Noonan went on to say that he is hopeful that students will rise through the ranks once they enter the working world. Goodwin believes that this program will prepare graduates not only to prepare tissue specimens properly, but also to take on leadership roles and identify what type of leaders they hope to become within their chosen field. I am proud to share with you that Goodwin College has been named one of the Hartford Courant/FoxCT Top Workplaces. The official announcement was made at an event late last week, so we can now begin sharing the news publicly. Most of you will recall that earlier this year, Goodwin was also named one of the 35 Best Places to Work in Connecticut by the Hartford Business Journal. While organizations for these awards are surveyed and the results analyzed by independent firms, it is worthwhile noting that the winners are selected completely on the basis of employee feedback in a number of different areas. That means that it was the collective opinions of our community that earned these honors for Goodwin. Last week, when the entire roster of Top Workplaces was announced by the Courant, it was interesting to note that Goodwin was the only college to make the list. This is a significant step forward in raising the region’s awareness of the work we do here and especially of the students we serve, who are preparing to take their places in the workforce. Please accept my thanks in making this great moment for Goodwin College possible. This award recognizes the community that we are all helping to build. 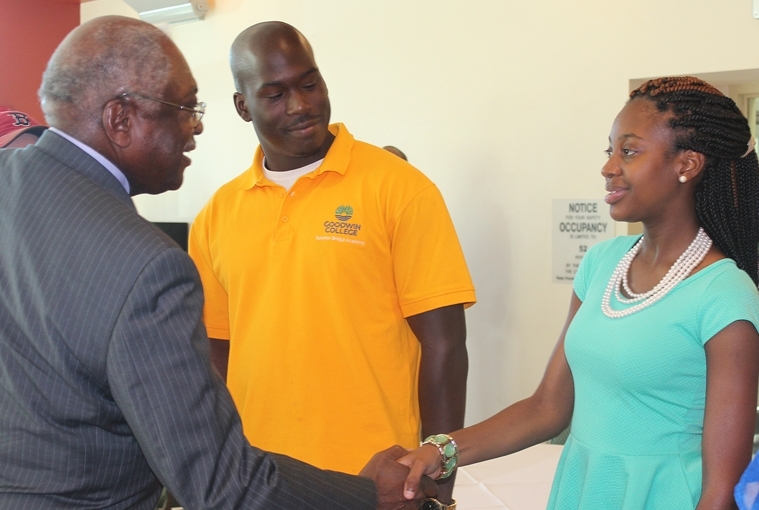 During his appearance at Goodwin College on September 22, celebrated civil rights icon Congressman James E. Clyburn told nearly 300 students, faculty, and staff that it’s important to never stop trying when something is really important. Clyburn, the nation’s highest ranking African American in the U.S. Congress, came to the Goodwin College Auditorium for a conversation about his recently published memoir, Blessed Experiences: Genuinely Southern, Proudly Black. The book is an account of the civil rights leader’s experiences in the Jim Crow-era South, from his humble beginnings as the eldest son of an activist fundamentalist minister and an independent civic-minded beautician all the way to becoming one of the country’s most well-respected voices on equality and government. The congressman urged the assembled students to never stop trying to achieve great things, and to make positive contributions to their world. He used the examples of Jonas Salk, who discovered and developed the vaccine for polio, and John Lundy, who developed a method to refrigerate and store blood for transfusions, as examples of individuals who had contributed to society. Clyburn also urged the audience to participate in democracy, and vote not just in large presidential elections but also in small, municipal elections. He said that it was the small, day-to-day elections that help to set the tone of the nation. “It is our participation that keeps the country centered,” Clyburn said. Clyburn was introduced by Congressman John Larson, who said that he was proud that Goodwin College was able to host so many recent influential, amazing individuals. “I’m extremely proud of Goodwin College,” Larson said. Larson said that by hosting speakers such as Clyburn and Rep. John Lewis, who spoke at the College’s graduation in June, Goodwin was doing its part to create an engaged and diverse environment. As part of its ongoing initiatives to promote manufacturing job growth in Connecticut, Goodwin College was proud to host Leo Reddy in a series of talks from September 16 to 18. Reddy, the Chairman and CEO of the Manufacturing Skill Standards Council (MSSC), made numerous guest appearances on campus and throughout the state to promote manufacturing credentials. Reddy spoke with high school guidance counselors and local business leaders in an effort by the MSSC to create a dialogue to bridge the gap between education and industry. Reddy said that the future of manufacturing was currently walking the halls of our high schools. Despite manufacturing’s outdated reputation as a less desirable profession, today’s manufacturers actually require a highly skilled, highly trained workforce that can move throughout the industry as marketplace demands change. Reddy praised Goodwin College’s efforts in manufacturing education, saying that the College’s program was an exemplary model of the kind of positive relationship needed between educators, industry, and government. “Goodwin College is doing more with our MSSC program than any other college in the country,” Reddy said. Goodwin is currently the only college in Connecticut that offers MSSC certification. Lentino said that students could have the opportunity, through partnership programs with the College, to begin earning manufacturing credentials while still in high school. Reddy also spoke to several students who were continuing their manufacturing education at Goodwin, personally presenting those who had completed their initial certifications with their MSSC certificates. Reddy appeared on WTIC’s “Mornings with Ray Dunaway” radio show and commented that other parts of the country have already embraced the certification concept and that it is just beginning to take hold in New England. Reddy wrapped up his visit to Connecticut by sharing his message with local business leaders at an East Hartford Chamber of Commerce Business After Hours event at Goodwin College. 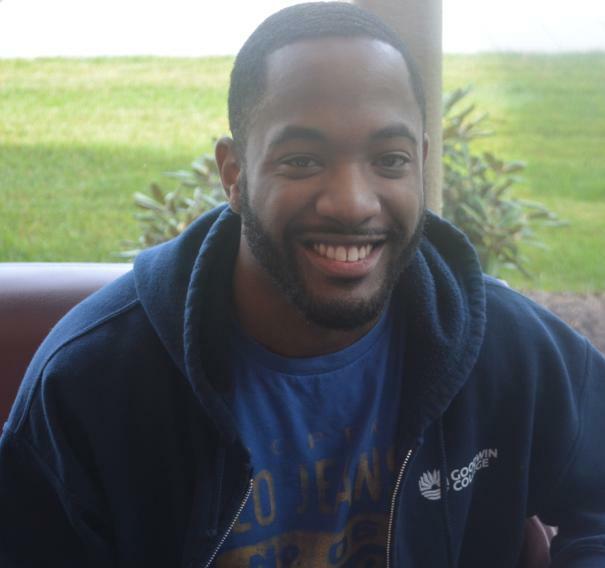 Darryl Kenney, the first MOVE or WISE student to ever get into Goodwin’s Nursing program, has big plans for his future. Kenney was introduced to Goodwin through the Summer Bridge Program, which is designed to bridge the gap for high school graduates looking to continue on into higher education. Once he was accepted into the MOVE program, Kenney felt ready to start his college career. 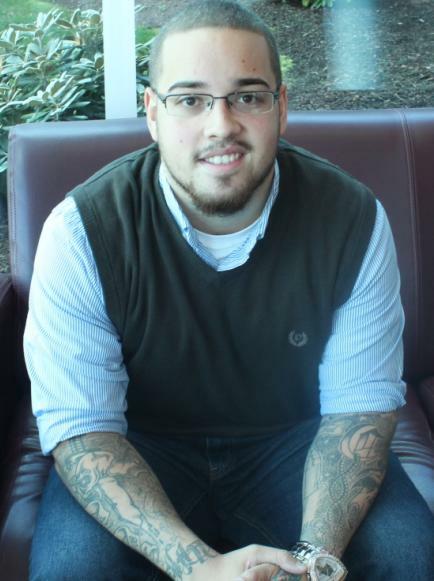 The program not only helped him financially, but also in ways he could have never imagined. The Nursing program is exposing him to the type of fast-paced, high-intensity environment he hopes to thrive in once he graduates. The MOVE and Nursing programs have not only helped Kenney become more of a leader, but they’ve also helped him stay on track and remain focused on his personal success. 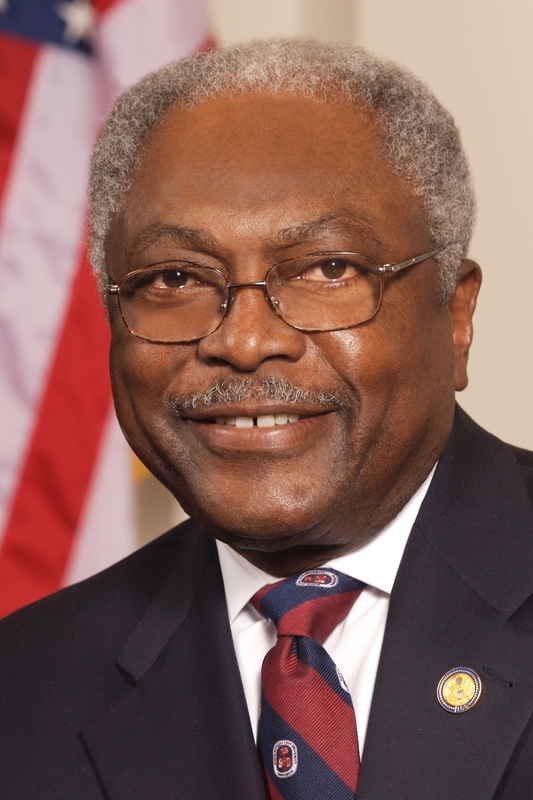 On Monday, September 22, at 9:00 a.m., Goodwin College will welcome civil rights icon James E. Clyburn, the nation’s highest ranking African American in the U.S. Congress, for a discussion about his recently published memoir, Blessed Experiences: Genuinely Southern, Proudly Black. The book traces Congressman Clyburn’s ascent from the Jim Crow-era South to highest corridors of power in Washington, D.C. The event will be held in the Goodwin College Auditorium, One Riverside Drive, East Hartford, CT. and is free of charge and open to the public. The Educational Opportunity Programs (EOP) hosted their annual Women Invested in Securing an Education (WISE) and Men of Vision in Education (MOVE) new student orientation on Wednesday, August 27. 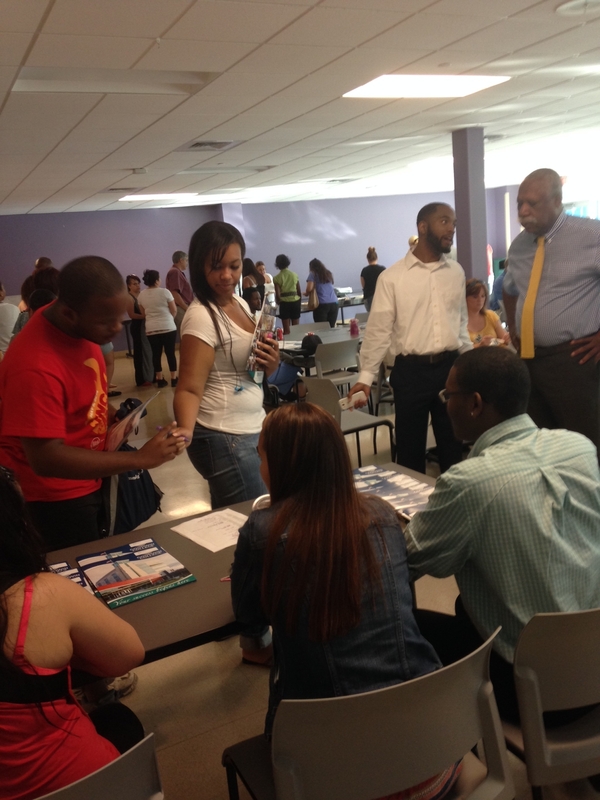 The program welcomed 56 new WISE/MOVE students and their parents to the Goodwin College Campus. The largest incoming class since the program began in the fall of 2008. This year’s orientation was run differently than in previous years. Under the supervision of WISE Coordinator Latanya Kennedy, the current WISE /MOVE students took the lead and guided the hour-long breakout sessions. “The older students provided guidance and leadership while presenting on the benefits of the programs. They encompassed the true meaning of giving back,” said Kennedy. During the breakout sessions, incoming students learned first-hand what it means to be a WISE/MOVE student, as senior members introduced the concepts of REAL (Respect, Empowerment, Accountability, and Leadership) and ROAD (Responsibility, Opportunity, Accountably, and Dedication), the WISE/MOVE core principals. In addition to discussing the program’s core principals, incoming students engaged in rich conversation with current students as they shared their personal experiences in the programs. Parents were treated to an interactive activity that highlighted the demands their students will face in the first year of college. Aaron Isaacs, the Director of EOP, led parents in an experiential activity that focused on student growth, while balancing education, life, and family. “I wanted an opportunity to engage parents as an extended support network and help them understand the critical role they play in their child’s collegiate success,” Isaacs noted. On behalf of Goodwin College’s Board of Trustees, Dr. John Walters provided the closing remarks for the event; he emphasized to students the importance of taking advantage of this life-changing opportunity and utilizing the supports that Goodwin College offers. Students and parents left the event excited and eager to start the fall semester. Edwin Castro, 2011 Goodwin College Human Services graduate and part of the first Men of Vision in Education (MOVE) graduating class, enrolled in school with the specific goal of working with and helping teenage boys. With a degree in hand, he is now living that dream. Castro has been working as a case manager at the Village for Families and Children in Hartford for almost three years. Castro helps to support the Village’s mission of building a “community of strong, healthy families who protect and nurture children” by providing young fathers ages 15 and up with the parenting skills they need to build a healthy family environment. Castro takes these young men under his wing during a five-year period, during which he watches the families learn and grow. “I’m doing what I want to do,” he stated. In 2008, as an expectant father himself, Castro chose to enroll in school with very little support from his family. Being the first in his family to attend college, he needed extra support and encouragement. “I needed a lot of extra help. All of the teachers at Goodwin have a common goal and that’s to see their students succeed no matter what,” Castro noted. Being a part of the MOVE program helped Castro a great deal financially and his mentors made a lasting impression. One of his mentors worked at the Village, where Castro was offered an internship and later a full-time job, before he had even graduated from the program. “My family understands now why it was so important to me to receive an education,” Castro commented. Aaron Isaacs, Goodwin’s Director of Educational Opportunity Programs, provided a strong foundation for Castro to succeed. “I always felt comfortable asking Aaron for help. He always listened to me about my struggles. I see myself in his shoes now. It’s come full circle,” Castro said. Castro uses many of his own life experiences and the lessons he learned at Goodwin through his classes and mentors to be the best employee and individual he can be. Goodwin College is developing a mentoring program that will pair Goodwin alumni from various programs with current students looking for educational and professional advice. The program will offer alumni the chance to share their insight, guidance, and experience with current students to provide a holistic environment that will allow them to succeed. Vanessa Pergolizzi, Student Engagement Associate, Nasreen Mustafa, Career Counselor, and Michael Wolter, Management and Leadership Program Director, are spearheading this significant program set to launch in 2015. “I’ve learned from my years as a mentor and a mentee that having someone to help prepare you, guide you, develop you, and be a resource to you as you enter into the workforce is a huge benefit. A program like this will not only enhance the Goodwin brand, but give our students the edge to succeed,” Wolter stated. For each new generation of students to thrive, they need support, encouragement, and vision. Being a mentor provides rewarding opportunities to pass on valuable life skills and is a meaningful way to continue to stay connected and leave a lasting mark. Pergolizzi, a 2007 graduate of Central Connecticut State University, is a great example of what it means to give back and stay involved. She was approached by her alma mater to join their mentoring program, the Central Sophomore Initiative, and graciously accepted the offer. She was paired with CCSU student and mentee Victoria Orozco, who is currently in the exploration stage and development process of her journey, like many young college students. Orozco joined the program to learn more about the types of careers offered and to get a feel for life after college and had the opportunity to job shadow Pergolizzi in her role at Goodwin. “Coming to Goodwin really opened my eyes. I learned new ways to network and get involved,” Orozco noted. Through this program, Pergolizzi was able to pass on her knowledge and expertise to a student who was looking for direction, encouragement, and assistance. “It feels good to be instrumental in nurturing a student’s goals and aspirations and to be a part of shaping them into unique individuals,” Pergolizzi noted. From a career viewpoint, students will put themselves in a much more marketable position by joining a mentoring program. Employers are looking for students who are involved, active in their growth, and motivated to learn and succeed. “Students will receive exposure to a variety of opportunities, ranging from job shadowing, career preparation workshops, and outreach opportunities. The program will ultimately lead our students to achieve success beyond graduation,” Mustafa stated. If you would like to learn more about the mentoring program or how to get involved, please contact Vanessa Pergolizzi at vpergolizzi@goodwin.edu or 860-913-2160.